Growing up in the country allowed me to wander freely as long as I followed these basic rules: Stay on our property and under no circumstances cross the Arkansas River that cut behind our house. The song “Walking After Midnight,” sung eloquently by the late Patsy Cline, reminds me of that freedom to explore without fear. Although the narrator of the song is looking for her lost love, the narrator could also be someone in search of the past in order to understand its significance. Grieving for someone seems to force us into a cycle of memories and what ifs. Since my father died last year, the month of June and Father’s Day seems so bittersweet now. Some days my emptiness is as big as the midnight sky. Last year’s June brought many changes. My father’s health had taken a turn for the worse in May, and I knew he would not be with us much longer. After my mother died in 2008 after a long battle with Alzheimer’s, my father seemed to rebound, and he enjoyed his life to the fullest. He was stubborn, opinionated, and very loving. I inherited my father’s stubbornness, and I believe I inherited his kindness and friendliness. He would talk to anyone, anytime, anywhere. When we camped at Cedar Bluff or the Sandpit, I could count on a lineup of people outside of our camper, formerly a small school bus, waiting for one of Bob’s famous breakfasts on Saturday mornings. He never turned anyone away. The pink bus at the Sandpit. People used to comment that I looked a lot like my father, and I always found this rather strange, since I was adopted when I was two months old. My father and I were so much alike that any slight similarity in temperament translated to a physical correlation in the mind of strangers or acquaintances not familiar with our story. I am still figuring out my story as I discover information about my birth family, but I know that I could never imagine a life without the father and mother who adopted me. I have wondered if I look like my birthfather, but I cannot imagine a life with him even if I knew who he was. Would my birth father have allowed me the freedom to walk after midnight? To make mistakes and suffer the consequences, and still feel a father’s love even as I was being grounded for a month? 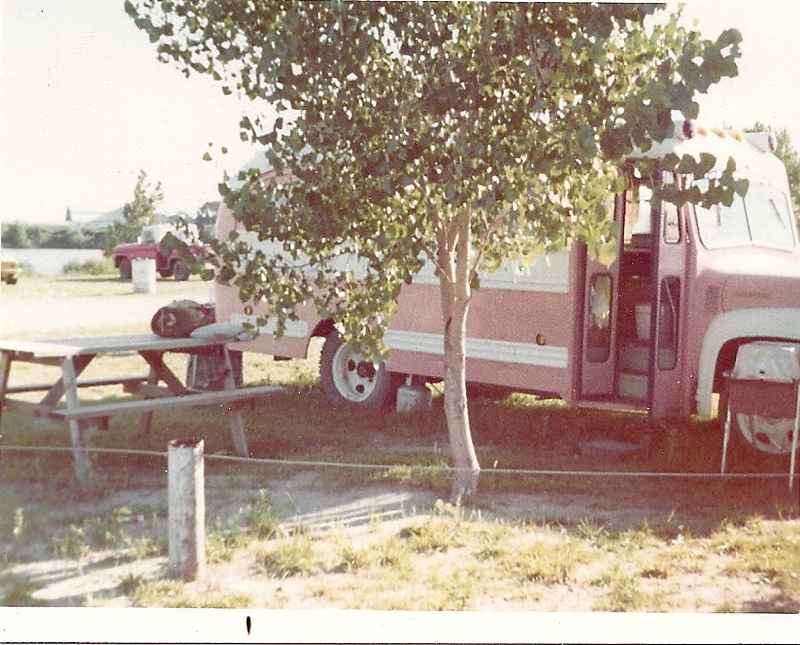 Would he have allowed me to paint our camper a bright pink? Would my birth father have choked up before walking me down the aisle and told me how much he loved me? 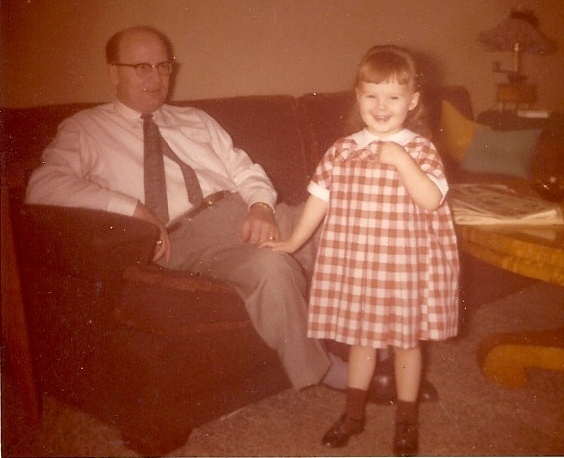 Would my birth father have held me at my daughter’s funeral as if I were a little girl again? No, I cannot imagine what my life would have been like without the father I ended up with. Isn’t that the way life is? A lucky roll of the dice or an incredible sacrifice by someone that ends up being someone else’s blessing? My birth mother gave me up for adoption: Sacrifice. That story is long and complicated, and I am working up the courage to write that story. I have seen pictures of her, and it is as if I am looking in a mirror. Lillian died in 1998, and I did not start searching for my birth parents until 2011, oddly enough, about nine months before I found out I had a brain tumor. When my original birth certificate arrived, my birth father’s name was listed as “unknown.” When I sent away for my adoption records, I had hoped to at least find out my birth father’s name, but all I learned was his date of birth and that he was of German ancestry. He was “not interviewed” for the adoption proceedings. When I asked the woman at the American Adoption Congress in Kansas why my birth father’s name was not listed, she replied that “unknown on the BC made it quicker to process the adoption at that time.” Even in 1955, expediency was the name of the game. Isn’t that what we do in life? We sometimes take a chance and do what feels right for us, but it may not be in the best interest of others. All I wanted was a name and perhaps a picture of him, but these are things I will never have. In a way, it does not really matter. I grew up loved. My adoptive parents wanted me, and my mother reminded me of this frequently. In 1955, they had no genetic markers or family stories to obtain a sense of who I might become. I was a tabula rasa in human form. They drove from Wichita to Dodge City, Kansas, and Connie Jo, my given birth name, became Melissa Jean. Family and friends welcomed me as if they always knew I would end up as Wilmer “Bob” and Margaret Lynn’s daughter. As I grew older and began to carve out my identity, I was allowed to ride my bicycle or my horse near the river or along the roads that defined the Wilroads Gardens community. The freedom I had to explore changed in 1965 when I was ten years old. I remember walking down the two-tracker that ran parallel to one of our fields to the river one day and sitting on a ledge above the dam. The Arkansas River flowed next to our land. I was allowed to be near it, but I was forbidden to cross it and head for Fort Dodge. Despite my parents’ adamant stance against crossing the river, my friends and I did this as often as we thought we could get away with it. But on this day, I had little time to waste because newscasters had warned of an impending flood. I wanted to see the river one last time. I looked at the small gates that were used to divert the water into an irrigation ditch, the concrete ledge that supported the gates and was the perfect spot to cross to the other side of the river, and the dirt-covered bank on the side of the river where I used to fish from. A wall of water heading our way from the mountains of Colorado would forever change the landscape. Our friends and neighbors in Wilroads Gardens and all low-lying areas of Dodge City, Kansas, moved quickly in preparation for the flood swiftly moving towards us. 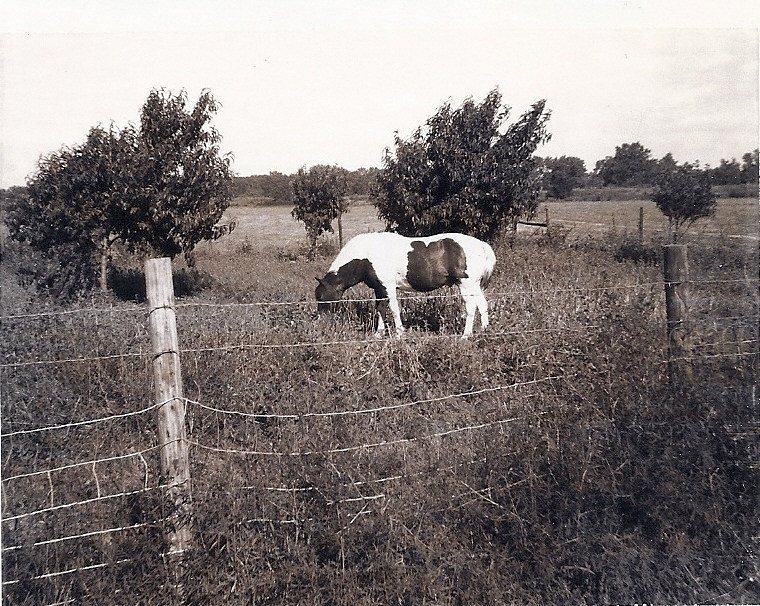 My father and several men loaded our cattle and my horse into several livestock haulers. I would never see those cows or Willie again. My mother packed everything she could into our cars, and she placed what she could not take on top of the furniture we had to leave behind. After spending a few minutes staring at the river that day, I left my favorite spot and ran down the two-tracker towards home. My mother seemed relieved when I returned and put me to work. My mother told me to pack my favorite things to take to my grandparents’ house where we would end up living for over a month. Content with my dog “Stinker” and purple Stingray bicycle, I said I was done. She suggested I pack some clothing. My mother and I drove into Dodge City and headed towards the north part of town and safety. My father stayed behind to place sandbags around our house, and then he and a large group of men worked feverishly near the dam, throwing sandbags down onto the hard ground in the hopes that they could save Wilroads Gardens from the brunt of the water’s destruction. As we listened to the radio that night, the announcer’s anguished words described the wall of water as it rolled towards Dodge City. I imagined my father standing near my favorite spot above the river, ordering the water to bypass our house. Luckily, my father and all of the men working near the dam were warned to head to higher ground long before the churning waters roared into town. They headed to a campsite on some rolling hills overlooking Wilroads Gardens and waited. Meanwhile in Dodge City, my mother and I waited—and worried—about my father’s safety and wondered if we would have a house to go home to. Later the next day, when my father finally called, we were relieved that he was alive as were the other men who had worked so hard to save our community. He said our house, east of the dam and south of the dike, had suffered some damage, and our fields and barns were destroyed. Everything left behind in our garage washed away, including a trunk filled with pictures of my father’s side of the family, and Willie’s saddle and bridle. If our animals had been left behind, they would have drowned as they were swept away. According to my father, when the dike that formed a ridge on the south side of the river broke, the main current somehow turned away from our house. He said we would not be allowed to return home until it was safe, and he did not know if it would be days or weeks. After the water receded, quicksand filled our yard, and rattlesnakes crawled aimlessly through the destruction. My father sold Willie and all of our cattle. It would be a long time until our land recovered. We, however, were luckier than some. Many people in our neighborhood had to start over with only the things they had taken with them. One of my best friends lost her house completely. It ended up in a dry river bed downstream from where it used to be. Although forbidden from entering the house, we went inside anyway. A child’s game sat in the corner, mangled and covered with mud. When we thought we heard someone coming—perhaps it was the house eerily moaning as the foundation shifted—we ran as fast as we could to escape. For the rest of that summer, we passed the time riding our bikes, playing with our toy cars in piles of dirt now covering our yards, and tried to ignore the smell that the floodwater left behind as it worked its way eastward. People in our community cleaned, salvaged, and rebuilt. My father warned me to stay far away from the dam and out of our fields. Life had become dangerous. As I climbed into bed every night and looked out my window, I could imagine the area next to our driveway where Willie used to roam and snort at me when I yelled his name out my window. West of Willie’s special pen, our field, once filled with grazing cattle, remained empty with only a border of cottonwood trees to remind us of the Arkansas River flowing nearby concealing the stories of its devastation as if a card player holding a pair of aces and eights. When my father died last August, I held his hand as he had once held mine as a child, and I thought of that tiny farmhouse I grew up in. My parents sold the house years ago when they moved to Michigan. I wish I could see that house again and my father standing by the back door asking me where I had been. I would like to thank him for everything he ever did for me. Father’s Day is going to be tough this year, and I know I am not alone in my sadness. Perhaps I will take a walk after midnight if only to the water’s edge in front of the house I live in now. I will close my eyes and remember the house I grew up in, and a river that could not wash it or a father’s love away.